Thanks to new solar leasing programs, eligible Community Energy clients across the Northeast are able to easily install solar panels on their roofs. Stephanie Boucher-Moriarty of Connecticut, wanted to save money on her energy bill by generating her own solar power and Community Energy helped her achieve her goal. Here, Stephanie shares a few reasons why she was glad to go solar! Why did you go solar? The main deciding point to go solar was the cost savings over the life of the system. Although the cost savings is not as large now, it will be in the future. We also feel very strongly about the environment and reducing our carbon foot print. We felt that solar was an environmental conscious choice to ensure that our natural resources are preserved for generations to come. Every staff member we have dealt with at Community Energy has been professional and helpful. I cannot say enough about our sales coordinator Drew Crowder. He was patient and took the time to explain to us all our options. What was the installation experience like? The installation experience was timely and professional. All employees on site at our house were friendly and you could tell they really enjoyed what they did. Everyone was happy to answer any questions we had and they cleaned up when they were done. The only way you could tell they had been there were the new panels on our roof. Top notch job! 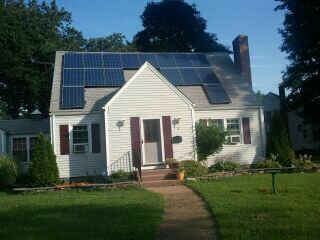 What would you say to someone else who is thinking about getting their home looked at for solar? I would say to someone that is considering solar that it can be scary to embark on a new technology but trust you are dealing with a company that knows what they are doing. Look towards the future and the benefits you will have not just to your electric bill but the benefits of using clean energy. What would you say to someone who has a solar proposal in front of them, but is on the fence? Think of the savings in 5 years or 10 years. When your neighbors are paying large utility bills every month, your savings will be great. You are investing in your future and the planet.